feeding you as we feed our own. Because we're passionate about what we do... and what we eat. At Highland Hollow, our goal is simple: produce the highest-quality meat products you can buy anywhere… at any price. That’s a lofty goal, but we’ll let our results speak for themselves. Most commercial meat comes from breeds chosen because they are easy to raise in large quantities. We choose heritage breeds because the meat just tastes better… and we think that’s worth a little extra work. Industrial-scale farming can’t afford the time and effort to provide individualized care. Our animals are raised and processed only one way: the RIGHT way. This simple approach yields consistently superior results. We are committed to forging long-term, personal relationships with each of our customers. We believe that if we provide you with high-quality products and treat you fairly, we’ll have a customer for life. Highland Hollow is not some huge commercial meat factory… we're your next-door neighbor family farmers. We're the Raylinsky family, and farming is our passion. We come from a long, proud lineage of real working farmers and butchers. 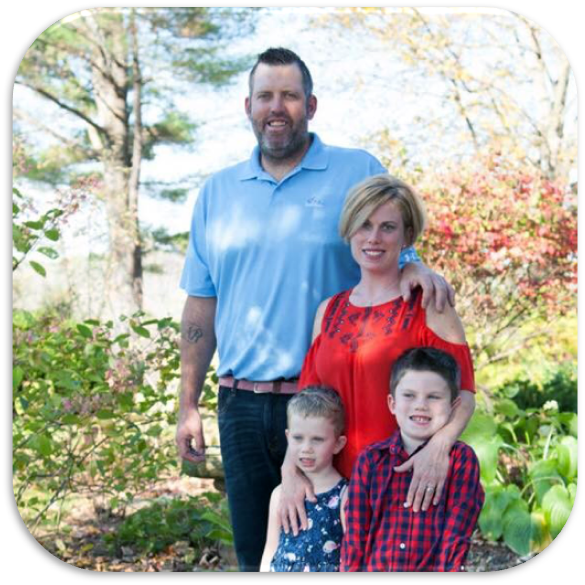 Dave Jr. is a fourth-generation farmer and third-generation butcher. He’s learned his craft, as well as a number of trade secrets, from his farming parents, Dave Sr. and Kim. Benaye is a mom to farmers-in-training Oscar and Olive, plus the farm manager and animal midwife. Together, we followed our dream, took the plunge, and founded Highland Hollow. We built our farm and our business from the ground up with blood, sweat, and tears. We began on the site of a historic 1788 stone farmhouse in Feura Bush, NY. When we outgrew that location, we moved to a beautiful 102 acre farm in the Schoharie valley in March 2016. Since then, we have expanded to 519 acres. Our philosophy is simple: we want to feed you the same way we feed our own family. Our animals are raised organically and naturally with care and respect. We treasure our heritage breeds and proudly carry on the traditions of farmers and butchers that preceded us. We work tirelessly to ensure that each and every piece of meat you purchase from Highland Hollow will be the best you've eaten. All of our beef is grass-raised/grain-finished and dry aged for 21 days. We don't HAVE to do that, and it's more work for us, but we do it anyway... because the result just tastes better. Our farm is filled with cows, chickens, pigs, lambs, and ducks – roaming free around the pastures of our home and farm in Upstate New York. You’ll need a map to find us – but that seclusion gives us rolling hills of pure green grass and clear ponds on which our animals live and feed every day. We are proud of our farm and love to share it with you... stop by and say hello! When you want the best meat, start with the best animals. 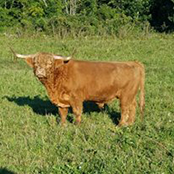 A Scottish cattle breed, Highland cattle are prized for their rich, tender, flavorful meat that is naturally lower in cholesterol and higher in Omega 3, Omega 6, and CLAs than other beef varieties. Highlands are kept at Balmoral Castle to feed the Royal Family of England. Beefmaster cattle are the first American composite breed (50% Brahman, 25% Hereford, and 25% Milking Shorthorn). 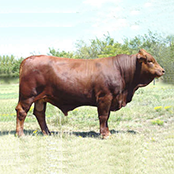 A large breed, Beefmasters are praised for their hardiness, fertility, and mild disposition. We are proud to own the only herd of Beefmaster cattle north of Kentucky. 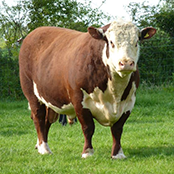 Hereford cattle originated in Herefordshire, England and are one of the most popular cattle for beef production worldwide. This hardy breed has a reputation for being great mothers to their calves. They produce rich-tasting beef with a yellow fat cover. Berkshire pigs (known as Kurobuta pigs in Japan) are considered “the Kobe of pork” due to the superior marbleization of their meat, making it particularly suitable for long or high-temperature cooking. 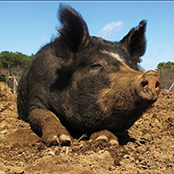 Our pigs are registered and can be traced directly to established English herds. 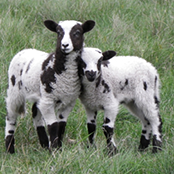 An heirloom breed, Jacob sheep are raised for their high-quality wool and leather, and their lambs produce a mild, lean, tasty meat partially due to the low lanolin content of their wool. Our Jacobs are fully registered. 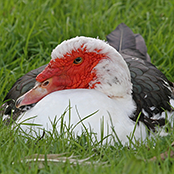 Native to Central and South America, Muscovy ducks are now domesticated throughout North America. Popular in Europe, they are large ducks with rich-tasting meat that is thin-skinned, deep red, low in fat, and very tender. The latest news from our farm. You can set up and appoint for other arrangements all custom orders due the Wednesday of that week.